It is reported that Disney DVD sales are down 15 percent year on year, partly due to the increasing popularity of digital purchases and video on demand. But this doesn't mean you can do nothing but leave your cherished DVDs on the shelf with dust covering them all. A simple way to vitalize these plastic discs again is to copy and rip Disney DVD for your variant uses with a professional DVD ripper. 1. DVD movies published by Disney studio are almost classic, which every DVD collector is by no means willing to see these discs get scratched, damaged or lost. Thus copying DVDs for safekeeping beforehand are much more preferred. 2. Having your DVD movies ripped to digital format and copied onto your have drive means you can conveniently play DVD movies on mobile devices such as iPhone, iPad, Android, and many more that don't have an optical drive. 3. Many DVD discs published by Disney cost ranging from $9.99 up to $27.99 each. Backing up these DVDs you've paid good money for to Walt Disney is a great idea to enrich your movie library. To do this task, an awesome DVD ripper is a must-have. 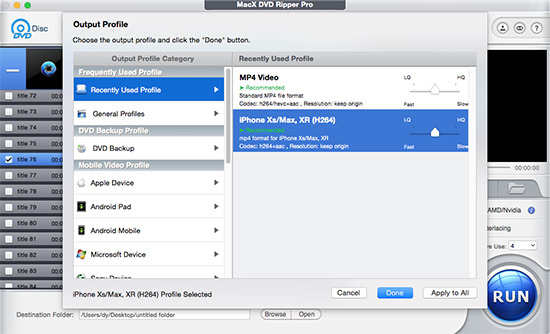 MacX DVD Ripper Pro is the professional Disney DVD ripper that can get rid of Disney DRM and makes the copy of DVDs such as Incredibles, Ralph Breaks the Internet, Frozen, etc to hard drive, and rip them into digital formats MP4, MOV, MKV, etc for playing on iPhone, iPad, Android on the go. Frankly, the DVD ripping task will be done with the aid of a DVD ripper. But this can be tricky to rip Disney DVDs, especially those newly released titles, such as Venom, Incredibles 2, Deadppool 2, Jurassic World: Fallen Kingdom, Hotel Transylvania 3, Avengers: Infinity War, Mission: Impossible - Fallout, to name a few. These DVD ripping tools will generally crash, pop up error messages or output files in disorder. Tech geeks put the failure down to the Disney copy protection scheme, known as Disney X-project protection, a set of access control techs for preventing any mal-use of the Disney copyrighted DVDs. This scheme, not only applied to Disney discs, but also the ones produced by Warner Brothers, Paramount, is manifested in multiple titles up to 99, along with movie size larger than 50 GB. Consequently, generally DVD ripper will fail to choose the right one with full movie content and cannot rip Disney DVD, or say, rip copy protected DVD into digital formats. Does this mean you cannot rip Disney encrypted DVDs and make a digital copy them? Absolutely not. MacX DVD Ripper Pro cuts the buck in decrypting Disney protection and ripping any Disney DVD effortlessly. It's recently updated with a big improvement in DVD analysis algorithm and renewed its title check mechanism, perfectly fixing all the DVD ripping problems that common DVD rippers encounter, including cannot scan title from 99 titles, Disney DVD oversized with 50GB, bad sector in DVD movies, output movie with distorted image and disordered audio, output files unwatchable on device, etc. So it can trouble-free remove intractable Disney DRM, let alone CSS, region code, Sony ARccOS or other general protection measures, choose the right title, and rip new DVD movies published by Disney, such as Venom, Ralph Breaks the Internet, Black Panther, Incredibles 2, The Nutcracker And The Four Realms, etc. as well as workout DVDs, Lionsgate DVDs, yoga DVDs, adult DVDs, damaged/unplayable DVDs to MP4 MOV AVI H264 MKV MPEG-2, latest iPhone iPad Android devices, game consoles, etc. You will be amzed by its lightning fast speed when ripping a full Disney movie, reaching a conversion frequency at up to 250-320 FPS. (thanks to the Full GPU Acceleration technology). Important notice: Ripping commercial DVDs involves the circumvention of copy protection schemes, which is considered as against the law, even those you purchased legally. Please contact your local law before doing the Disney DVD ripping and be sure not for any commercial use. Prior to ripping DVD, please make sure your DVD ripper is most suitable for your operating system. 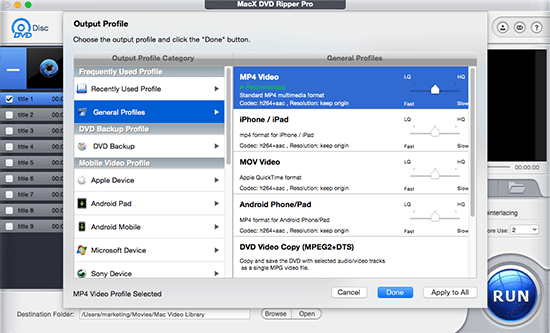 For people who want a DVD ripper on Mac, feel free to download MacX DVD Ripper Pro. For PC users, you can download the best DVD Ripper on your Windows. Here we take copying Disney DVD on Mac version for example. Step 1: Launch the DVD ripper for Mac, insert a disc from DVD driver by clicking "DVD Disc" or from DVD folder, DVD ISO image file. Tips: the software can automatically detect the correct title from the 99-title DVD to ensure the main movie content to be ripped. Step 2: Scroll down Output Profile and select any output format you desire. The Disney DVD ripper for Mac supports to copy Disney new movie DVD releases with no quality loss and also original 5.1 channels Dolby AC3/DTS audio, rip DVD to Mac, MP4, MOV, AVI, FLV, MKV, iTunes, iMovie, and converting DVD to iPhone(iPhone XS/XR/X/8/7/6S/6 Plus), iPad Pro/Air 2, HTC M10, Samsung Galaxy S9/Note 9, WP8, Surface Pro 4, PS4, etc. Note: It is available for you to tweak the audio/video settings, be it resolution, codec, bit rate, or frame rate, merge multiple titles into one, trim the movie, cut off unwanted part of the Disney film, add external subtitles or hardcode the subs before conversion. Step 3: Click "RUN" button to start Disney DVD ripping on Mac. After a few minutes, you can get converted Disney contents. If you wanna replay the ripped DVD content on iPhone iPod iPad, you are suggested to use MacX MediaTrans iOS data manager to easily transfer video from computer to iDevices. For Your Preference: Although the legality of copying or ripping DVD discs is murky at best, as has been the duplication of all digital media since its advent, this by no means indicates you can discharge the local laws or make DVD copy for trafficking. Anyway, bypassing any DRM technologies is illegal. We only advocate you to consult the local laws before ripping copy protected DVD, make personal copies of DVD if you are the original purchaser of the disc, remain in your home specifically for personal use. Since Disney fake, Disney' Trick, Disney X-Projected DRM, etc are widely used in copyrighted DVDs released by Hollywood, Disney, Paramount, Warner Home Video, etc, the copy of protected DVD is set back to a great extent. Is there any free DVD copy/ripper software to handle the DVDs with Disney copy protection schemes? According to our test, many so called best DVD ripper for Mac including DVD Cloner, DVDFab, AnyDVD, etc do not support decrypting Disney copy-protected DVDs. Generally, customers are accustomed to rip DVD on Mac or PC using Handbrake as it is the world famous open-source free DVD ripper and video transcoder. But constant Handbrake errors occur when ripping the Disney copy protected DVDs. What's Digital Rights Management: Abbreviated to DRM, it is a general term containing any access control technologies used by copyright holders to protect copyrighted content against piracy and unauthorized copying. DRM simulation can be chaotic. Apple pushes its FairPlay; Microsoft has its Windows DRM; Sony has OpenMG; while Disney applies X-project protection to its DVD discs to safeguard itself from piracy. The upshot is that many common DVD rippers cannot work on these Disney DVDs, or those Disney protected DVD movies after ripping turn out to have extremely garbled video and audio. Frankly, it's seldom you can decrypt and rip a Disney produced DVD without error. 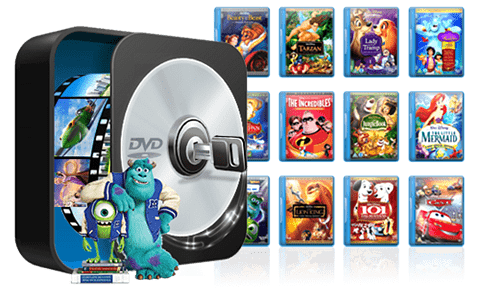 On the contrary, you may notice that many DVD fans experience a fool's errand in ripping many Disney DVDs, but many of them don't know what Disney DRM copy protection is, not to mention the differentiation of DVDs that are Disney copy-protected or not. Sincerely for your sake, it's of necessity for you to figure out whether the Disney DVD is copy-protected by Disney Fake or not. How to judge? Follow me! 1. Disney copy protected DVDs usually has 99 titles used to confuse general DVD rippers. Only one is the main and right title containing the complete movie content. 2. DVD publishers, particularly Disney studio, makes newer DVDs appear way oversized, up to 50GB, which leads to impossible backup or copy of Disney DVDs. 3. You put a DVD published by Disney into a DVD player but find it's unplayable, your DVD may be Disney DRM protected. 4. General DVD backup and rip tool may crash halfway or error message pops up when you backup Disney encrypted DVDs. 5. The videos you rip from Disney DRM protected DVD usually turn out to be garbled, or video audio out of sync, etc. Fail to backup DVD Big Hero 6? Never mind, this guidance provides you the best solution to free rip and copy Disney DVD Big Hero 6 with the aid of a functional DVD ripper. To decrypt and rip DVD Maleficent staring Angelina Jolie for watching on the go is next the best choice for Disney movie enjoyment. Here guides you how to decrypt and copy DVD Maleficent to hard drive, iPhone XS/XR/X/8/7/6S/6/6 Plus, iPad Air 2/mini 3, Android for unlimited watching. Longing for ripping DVD Frozen to MP4 format? This tutorial will illustrate you how to rip DVD Frozen to MP4 on Mac easily, so that you can easily import Frozen DVD for playing on iPhone, iPad and other devices on the go. MacX DVD Ripper Pro is has the best solution to rip Disney DVDs on Mac. It will decrypt Disney movies' 99-title protections easily, and convert DVDs into mp4, mov, avi, 3gp, mkv, iso image and more with a speed 5x faster than others. No need to worry about the quality at all.